Tymon Mellor: At the end of the nineteenth century, the great world powers were all trying to expand their spheres of influence within China. The approach of the British was to use Hong Kong as a marine trading hub, enhanced with the provision of a railway network thus extending the Colony’s commercial reach into the Chinese hinterland and connecting with other railways being planned by Germany, Belgium and the United States of America. Thus was born, the Kowloon Canton Railway. The original idea for a Kowloon Canton railway was first proposed in 1864, by renowned railway engineer Sir Rowland Macdonald Stephenson. Stephenson was instrumental in the development of the railway network in India and with the encouragement of Jardine, Matheson & Co had proposed a comprehensive railway plan for China in 1859. 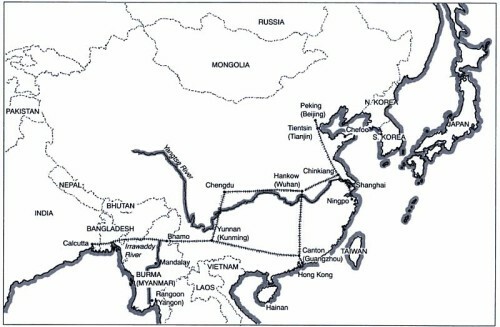 Over the next few decades, while the Hong Kong Government was trying to deal with the “knotty problem”, a number of new railways were proposed for China, notably the Peking-Hankow [Wuhan]-Canton Railway to be constructed by the American China Development Company and the Peking to Hankow [Wuhan] line to be constructed by the Belgians, acting on behalf of the Russians. 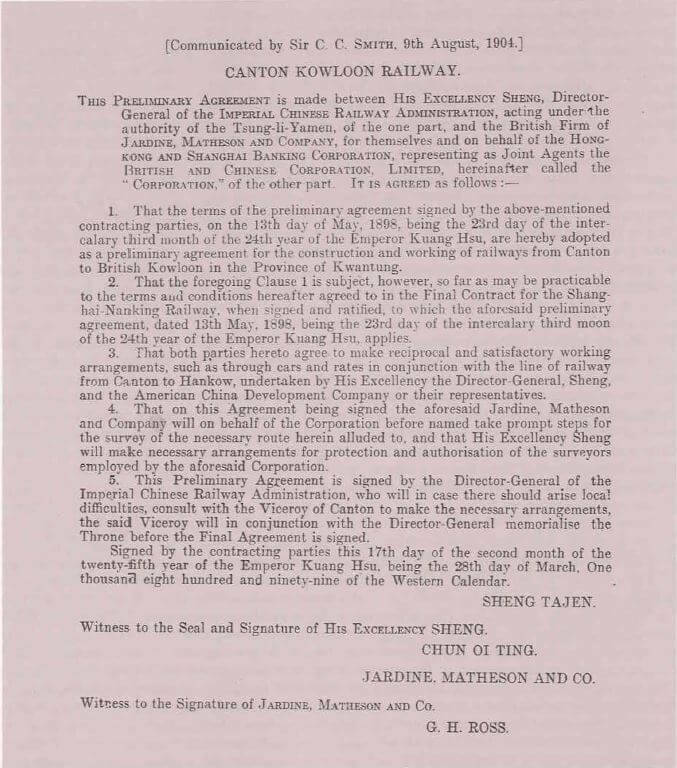 Recognising the change in environment, the British and Chinese Corporation, a joint venture between Jardine Matheson and the Hong Kong and Shanghai Bank obtained a number of railway concessions including the Canton-Kowloon Railway, the southern sea port extension of the Peking-Canton line. 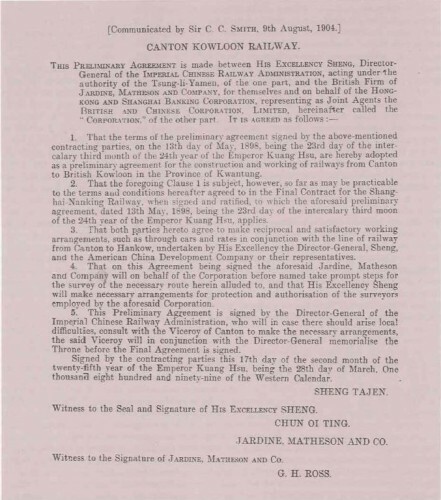 A preliminary agreement was signed on the 28th March, 1899 for the Canton-Kowloon Railway with the Director of the Imperial Chinese Railway Administration, and survey work for the route commenced almost immediately. Further development, financing and approval for the railway proposal stalled for a number of reasons; discussions with the Chinese officials were complex and linked to the progress of other concessions notably the Shanghai-Nanking Railway; uncertainty in the financial markets due to the Boxer Rebellion and the Boer War in South Africa along with the growing influence of the French in the south China region. The latter, who in 1901 obtained Imperial sanction for the construction of the Canton-Wuchow railway line, direct competition to the American China Development Company line along with proposed lines that would conflict with the proposed Kowloon Canton Railway. Under diplomatic pressure from the United States, the Chinese rejected the French requests and work commenced by the American China Development Company on a branch line to the Canton-Hankow railway. The 10 mile line from Canton to Fatsham [now Foshan] was opening on the 15th December, 1903, with invited guests including Henry May who would later become Governor of Hong Kong. During construction of the branch line it became clear to the Americans that if the Canton-Hankow line was to be a success, it required access to a deep water port to allow the transfer of cargo into ocean going liners. The waters of the Pearl River were unsuitable due to tides and silting whereas Hong Kong was an established deep sea port and could now be the terminus for the great trans-China railway. In 1903 discussion were undertaken between the American syndicate and the British & Chinese Corporation as how the two groups could work together on building the Kowloon Canton Railway. At the same time there were rumours that the Belgians, working on behalf of the French were purchasing shares in the American China Development Company in preparation for a takeover bid and to gain control over the railway. During 1903 and 1904 the Hong Kong Government, supported by the British Government played an active role in trying to move the project forward and ensure the line was constructed for the benefit of Hong Kong. In May, 1904 the Secretary of State for the Colonial Office in London put forward the suggestion that the Hong Kong Government should be responsible for building the part of the line in British territory, which would then be leased to the British & Chinese Corporation to be worked in conjunction with the section within Chinese territory, which would be built under the terms of the existing concession. Discussions continued throughout the summer of 1904 and into the autumn between the Colonial Office in London, the Hong Kong Government and the Corporation, and finally led to a broad agreement that the Hong Kong Government should undertake the construction, financing and operation of the section within the colony while the section within Chinese territory would be financed by a loan raised by the British & Chinese Corporation on behalf of the Chinese Government, built by the Corporation but thereafter operated by the Chinese. The British Government would undertake to provide such assistance as might be needed to hasten the conclusion of a final agreement for the Chinese Section. 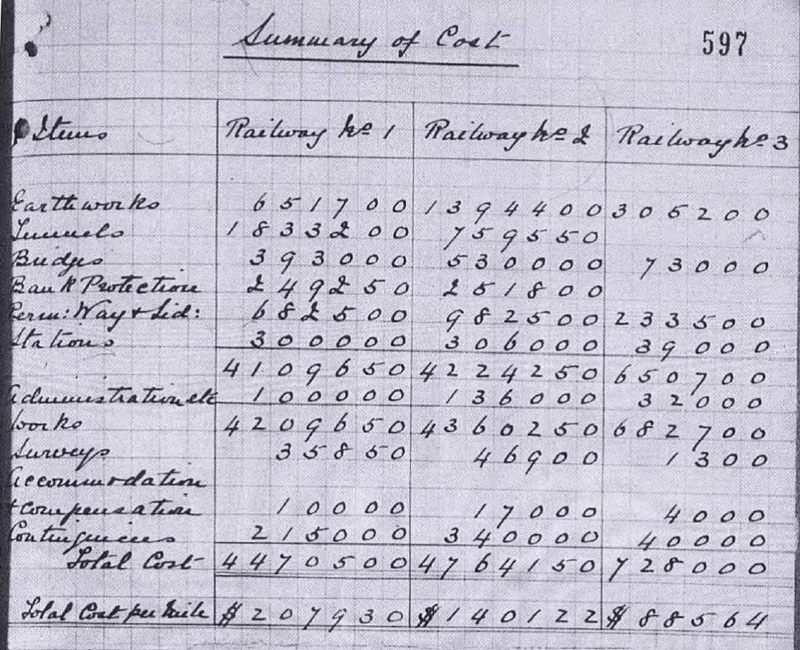 A complicated funding arrangement was drawn up and the financial arrangements were ratified by the passing of a Bill in October 1905 in the Executive Council in Hong Kong known as “The Railway Loans Ordinance”, which made constitutional history by receiving all three readings in one day. Thus, construction of the KCR (British Section) as it came to be known, could proceed. There remained for the Chinese Section to complete the negotiations for a final loan agreement and after protracted and difficult negotiations that was signed on the 7th March. 1907. The finance was provided by a bond issue floated in London in April of that year. Following the 1899 survey, additional survey work was undertaken and two additional railway alignments were developed. Formal approval for the route selection was gained from the Colonial Office in London in February, 1906. After many years of talk the prospect of a railway linking Hong Kong and China was almost a reality, and the threats to the Colony’s future were eliminated. a westerly route had been proposed by the Director of Public Works, Mr W Chatham to avoid the steep ascent and descent over the Kowloon Hills. The alignment ran via Tsuen Wan and Tai Lam Chung to Castle Peak Bay, and then followed the valley to Yuen Long and the frontier at Lo Wu. The survey for the railway alignment was completed within the year allowing a commercial proposal and final contracts to be prepared by the British and Chinese Corporation. 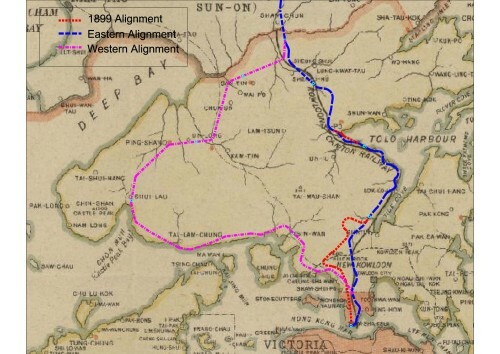 The alignment was to be known as the “high level eastern route via Tide Cover”, passing between Kowloon and the New Territories over a high level pass, the route the Tai Po Road was to follow. Details of the alignment are described in the 1905 Preliminary Survey British Territory Engineers Report. “This route appears to be the best possible high level route to Lo Fu from Kowloon via Tide Cove. Commencing at the place now known as Blackhead’s Reclamation [now Tsim Sha Tsui], Kowloon, the line passes in the first mile, at about the level of the present reclamation under Elgin Road [now Haiphong Road] by means of an over-bridge. Under the parade ground in a tunnel [formerly Whitfield Barracks and now Kowloon Park] emerging there from about 400 feet north of Austin Road. Total length of tunnel, about 700 yards. No difficulties are then encountered until about 2½ miles have been traversed in very much the direction of the new Frontier Road [Tai Po Road], which this route follows closely as far as the seventh milestone. At 2 miles a 1 in 40 gradient is adopted and maintained for a distance of 15150 feet as an up-grade, and for 15870 feet as a down-grade. On this gradient there are six tunnels, aggregating 2750 feet in length, or say, 920 yards. The last is approached by two 3 [degrees of curvature] curves (reverse), containing 144 degrees and 163 degrees of curvature respectively. A viaduct requiring four spans of 150 feet, with a maximum height of 130 feet, spans the Shing Mun River on the latter curve. Two other viaducts occur in the sixth mile one of two spans of 100 feet the other three spans of 100 feet. 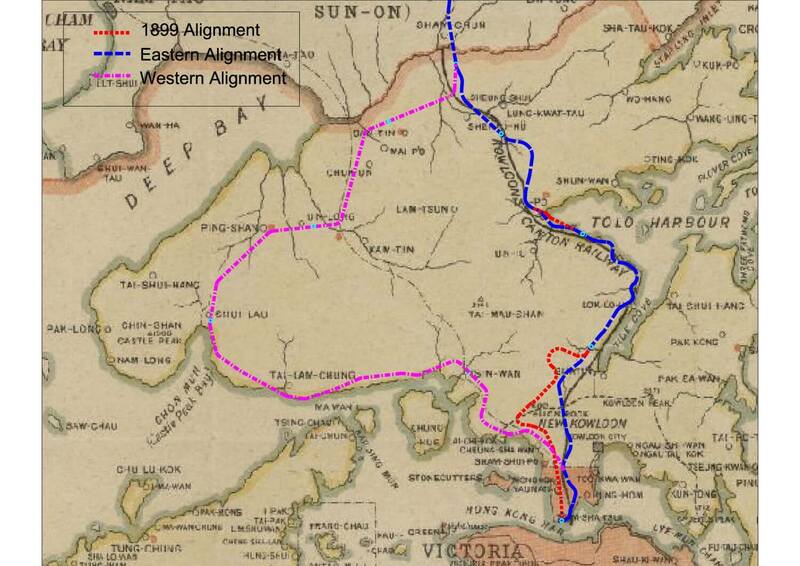 As described above, the alignment follows the Tai Po Road (opened 1902) for much of the length. However, there is a significant deviation as the alignment descends towards Tai Wai. To maintain the 1 in 40 gradient, the railway alignment swings north crossing the Shing Mun River and continuing its descent on the slopes on the north side of the river. The alignment crossed the flat farmlands by Tai Wai then followed the coast line and Tai Po Road around Tide Cove, cutting through headlands in tunnels and crossing bays on embankments. “This route commences on a proposed reclamation in Hung Hom Bay to the east of Blackhead’s Reclamation. The Kowloon terminus of this railway would be situated on the proposed reclamation. From this to the end of the third mile the work is of a fairly moderate character, with the exception of a heavy cutting on leaving the reclamation site, having a maximum depth of 74 feet, but as this material will be required for reclamation purposes, the magnitude of the cutting may be looked upon with equanimity. At the beginning of the fourth mile (175000 feet) the railway pierces “The Range,” passing through “Beacon Hill” in tunnel 2467 yards long. I am of opinion that, with the exception of some 50 or 60 yards at the north end, the whole of the tunnel will be through the yellow granite of this country, which is not a hard granite to bore through. It is probable that water in considerable quantities may be encountered during the progress of the works. I have accordingly laid the gradients so as to .facilitate drainage by gravitation and avoid pumping, assuming that the tunnel will be excavated from both ends, and meet at or near the centre. Owing to the very abrupt slope on both sides of “Beacon Hill,” I consider it inadvisable to make provision for the sinking of shafts, and consequently have not included them in my estimate. Having only two faces to work upon will, of course, tend to retard progress, but I think that the probable total rate might be put at four feet per day at each face, working three eight-hour shifts, in which case it would take 2½ years to put it through. Leaving the north end of the tunnel and running down some 3500 feet of side hill work in the Sha Tin Valley on a 1 in 100 gradient, paddy fields are reached and run through for a distance of about 3500 feet. Close to the village of Tai Wai the line crosses the Shing Mun River (one of the largest streams in the “New Territories”) by means of a bridge of three spans of 30 feet, and at 6½ miles from Kowloon Terminus the site of Shatin Station is reached. This station is close to the frontier road, and is about the most central position for serving the surrounding villages of which there are a great number. From Sha Tin Station to Tai Po Station in the thirteenth mile, the line follows, as closely as possible, the west coast line of Tide Cove, and the south coast line of Tolo Harbour. With the exception of the tunnelled portion of the railway, this portion is the most expensive to construct, chiefly on account of the large amount of bridging necessary for dealing with tidal water, and of bank protection required to resist the action of waves. The rise of tide there is not more than nine feet, and I originally fixed my rail level at sixteen feet above low water of ordinary spring tides. But having witnessed a typhoon there last August, I deemed it advisable to raise the rail level to 18 feet above low water, which l think should be sufficient to ensure the safety of the ballast. At Tai Po Station, a station ground of considerable width may ultimately be required, and facilities should be provided there for loading and discharging seaborne goods. I have therefore shown on the plan a jetty and landing stage which would also afford some shelter for small craft in stress of weather. I am of opinion that Tai Po Station would ultimately become the busiest way station on this route, certainly as regards first class passenger traffic, and express goods. In this attractive locality there are plenty of fine building sites on Crown lands suitable for villa residences and bungalows, within easy reach of the station, which would undoubtedly bring forth their crop of houses in due season, were railway communication established with Kowloon. In addition to the considerable fish and general trade that may be expected from Mirs Bay, considerable business might also be expected to be done in carrying supplies to such of His Majesty’s ships of the China Squadron as might be anchored in Mirs Bay. On leaving the station two rivers have to be crossed, one at 69000 requiring a bridge of five spans of 40 feet, the other at peg 71200 of five spans of 30 feet. From this to Lo Fu the line passes through paddy fields throughout its entire course, with the exception of a cutting at tbe fifteenth mile. This is the most thickly populated and extensively cultivated district through which the line passes. At Fanling Station in the nineteenth mile, Railway No. 1 makes junction [sic] with Railway No. 3 [this is where the a branch line to Yuen Long would connect], which runs from there to Yuen Long as a branch line, some eight miles in length, to either Railway No. 1 or Railway No. 2, whichever may ultimately be adopted. Pineapples are grown in considerable quantities, also vegetables and some rice, but there does not appear to be a large acreage under cultivation. A considerable trade appears to be done in pine firewood, which is sent in junks to Hong Kong. From the tenth to the nineteenth mile the line hugs the coast line, which is extremely rugged and rocky, as closely as possible. In fact after the Islands of Tsing I [Tsing Yi] and Ma Wan have been·passed, I think it is doubtful whether the line could be thoroughly secured against the action of the waves in places. At 19½ miles a station is provided at the market village of San Hue, at the head of Castle Peak Bay, which would supply a certain amount of passengers and goods, but not in encouraging quantities, as competition with existing, and perhaps improved, water communication with Hong Kong would have to be encountered and dealt with. From 19½ to 20th mile there is no cultivation. At the 21st mile a watershed is .reached, and from the 20½ miles to the 25th, i.e., the Yuen Long Station, the country is thickly populated, and the valleys highly cultivated, rice, sugar-cane, peanuts, and sweet potatoes being the chief crops. At Yuen Long a factory for the manufacture of oil from peanuts, sham shu fin crackers, and joss sticks appears to do a good business, and at Ha Tsun, a neighbouring village, bricks and shell lime are manufactured in a small way. This station would serve the thickly populated and fertile valley of Pat Heung with or without a branch line. At the 26th mile the Pat Heung (Kane Tin) River is crossed by a bridge of three spans of 60 feet. This river is tidal but not navigable at the crossing by any craft at low tide. I am told no masted vessel ever passes there, so that a railway bridge would not interfere with any existing rights or privileges. An alternative route is shown for this crossing on the plan, which shows better alignment but would be more expensive, as it would require more bridge opening preferably a screw pile viaduct of say twenty spans of 20 feet or thereabouts. From the 19th to the 28th mile the work is all light. At the 28th mile the gradient is 1 in 100 for 4 200 feet, culminating in rather a heavy cutting of 50 feet maximum depth. From 26th to the 30th mile the country passed through is cultivated, though sparsely populated. At the 30th mile the village of San Tin is reached; population about 1500. A flag station and siding might possibly be .instituted here with advantage but the run between it and Lo Fu is too short, and the district too small to admit of a main line station being provided. All through the 32nd mile there is very little cultivation, but from there to Lo Fu the line passes through well-watered paddy fields of great extent. Administrative, Naval and Military advantages. 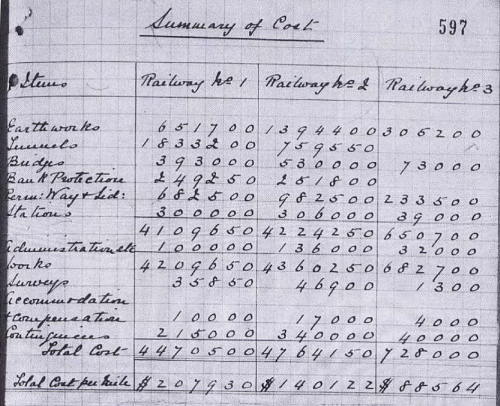 In February, 1905 the Colonial Office negotiated with the firm John Wolfe Barry & Partners [now Hyder Consulting Ltd] for a fee of £5,500 to undertake a detailed survey of the East and West line. However, the Governor Sir Matthew wanted an alignment review and cost estimates so a final decision could be made on the alignment selection. A revised scope was negotiated, a three month study to establish the route, for a revised estimate of £1,782 to be followed by a detailed survey of the selected route. With the signing of the contract on the 10th May, 1905; Mr J C Bruce Chief Survey Engineering and Mr F W W Valpy as his assistant sailed from London on the S S Marmora two days later. 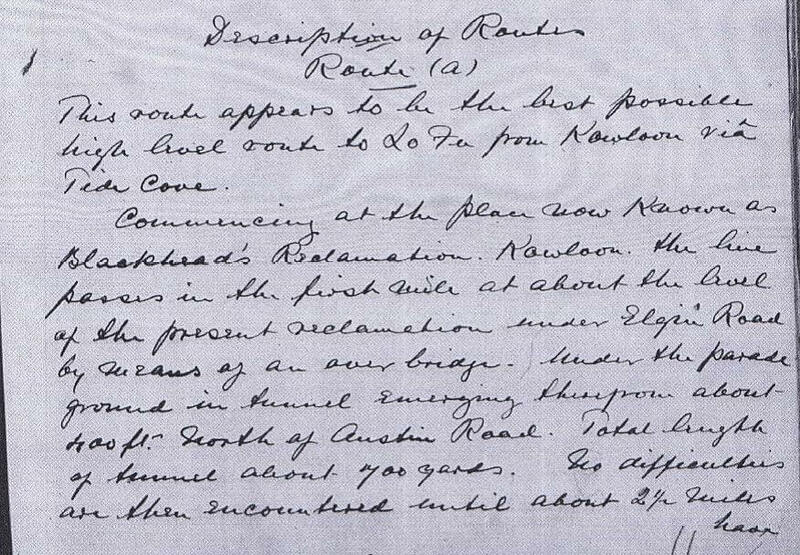 On arrival in the Colony, they commenced the survey of the Eastern route and by the beginning of August, 1905 had established an alignment utilising a 2,500 yard tunnel (Beacon Hill Tunnel) to pass under the Kowloon Hills, with the northern part of the alignment followed closely the route established in 1899 by Somerville Large. The revised cost of the line was less that the Somerville Large estimate. 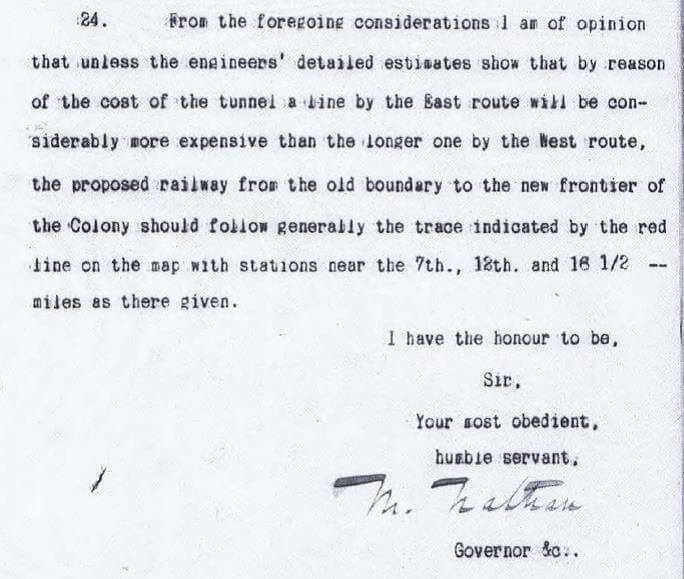 The initial survey of the Western Route confirmed it would be longer and also more costly due to “very heavy expenditure between Castle Peak and Kowloon”. By September, 1905 it was clear that the Eastern route would be adopted. To get the project off the ground, the Governor Sir Matthew Nathan, proposed to commence construction of the railway formation between Tai Po and Lo Wu using the Public Works Department. The route would be used as a road until the rest of the railway alignment was complete. “the West route passes through 19 miles of country (a length nearly as great as that of the whole East route) which, as he expressively put it, “won’t pay for axle grease””. To improve access to Yuen Long, the Governor recommended the construction of a branch line, surveyed at 8 miles and 1.75 furlongs, estimated to cost $728,000. 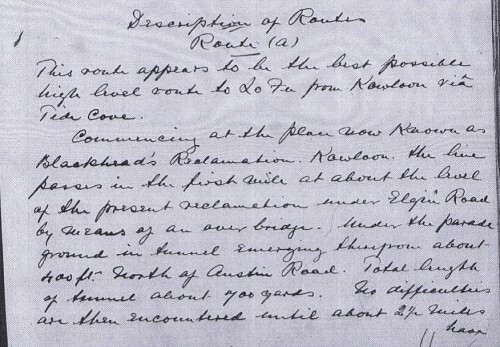 The letter concludes that the Eastern alignment is to be adopted and the Chief Surveying Engineers has been instructed to proceed with marking out the alignment north of the Kowloon Hills. 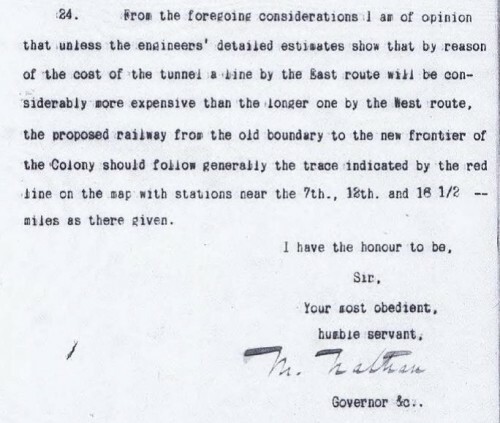 The Governor requests that the Colonial Office “give directions to the Consulting Engineers, to whom a copy of Mr Bruce’s report, estimate and plans goes by this mail, to take the necessary steps for proceeding with the construction of the line with the least possible delay”. On the 9th December, 1905 work commenced on the railway embankment by the Public Works Department and by May, 1906 preliminary work commenced on Beacon Hill tunnel. Part 2 will describe the construction of the railway. This article was first posted on 21st July 2015.